Niobium, formerly known as columbium, is a chemical element with symbol Nb (formerly Cb) and atomic number 41. Niobium is a strong, light grey, crystalline, and ductile transition metal. Pure Niobium has a hardness similar to that of pure titanium, and it has similar ductility to iron. Niobium oxidizes in the earth's atmosphere very slowly, hence its application in jewelry as a hypoallergenic alternative to Nickel. Titanium is similarly used in the jewelry industry for similar reason due to its similarity to Niobium Chemically and Physically. Niobium is often found in the minerals pyrochlore and columbite, hence the former name "columbium". Its name comes from Greek mythology, specifically Niobe, who was the daughter of Tantalus, the namesake of tantalum. The name reflects the great similarity between the two elements in their physical and chemical properties, making them difficult to distinguish. Niobium is estimated to be the 34th most common element in the Earth’s crust, with 20 ppm. Some think that the abundance on Earth is much greater, and that the element's high density has concentrated it in the Earth’s core. The free element is not found in nature, but niobium occurs in combination with other elements in minerals. Minerals that contain niobium often also contain tantalum. Examples include columbite ((Fe,Mn)(Nb,Ta)2O6) and columbite–tantalite (or coltan, (Fe,Mn)(Ta,Nb)2O6). Columbite–tantalite minerals (the most common species being columbite-(Fe) and tantalite-(Fe), where "-(Fe)" is the Levinson suffix informing about the prevailence of iron over other elements like manganese) are most usually found as accessory minerals in pegmatite intrusions, and in alkaline intrusive rocks. Less common are the niobates of calcium, uranium, thorium and the rare earth elements. Examples of such niobates are pyrochlore ((Na,Ca)2Nb2O6(OH,F)) (now a group name, with a relatively common example being, e.g., fluorcalciopyrochlore) and euxenite (correctly named euxenite-(Y)) ((Y,Ca,Ce,U,Th)(Nb,Ta,Ti)2O6). These large deposits of niobium have been found associated with carbonatites (carbonate-silicate igneous rocks) and as a constituent of pyrochlore. Small amounts of oxidizers like sodium nitrate are added to enhance the reaction. The result is aluminium oxide and ferroniobium, an alloy of iron and niobium used in steel production. Ferroniobium contains between 60 and 70% niobium. Without iron oxide, the aluminothermic process is used to produce niobium. Further purification is necessary to reach the grade for superconductive alloys. Electron beam melting under vacuum is the method used by the two major distributors of niobium. Although niobium exhibits all of the formal oxidation states from +5 to −1, the most common compounds have niobium in the +5 state. Characteristically, compounds in oxidation states less than 5+ display Nb–Nb bonding. In aqueous solutions, niobium only exhibit the +5 oxidation state. It is also readily prone to hydrolysis and is barely soluble in dilute solutions of hydrochloric, sulfuric, nitric and phosphoric acids due to the precipitation of hydrous Nb oxide. Nb(V) is also slightly soluble in alkaline media due to the formation of soluble polyoxoniobate species. As with other metals with low atomic numbers, a variety of reduced halide cluster ions is known, the prime example being [Nb6Cl18]4−. ^ G.V. Samsonov, ed. 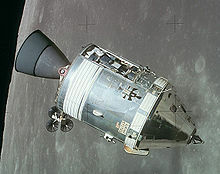 (1968). "Mechanical Properties of the Elements". Handbook of the physicochemical properties of the elements. New York, USA: IFI-Plenum. doi:10.1007/978-1-4684-6066-7_7. ISBN 978-1-4684-6066-7. Archived from the original on 2015-04-02. ^ Matthias, B. T.; Geballe, T. H.; Geller, S.; Corenzwit, E. (1954). "Superconductivity of Nb3Sn". Physical Review. 95 (6): 1435. Bibcode:1954PhRv...95.1435M. doi:10.1103/PhysRev.95.1435. ^ a b Peiniger, M.; Piel, H. (1985). "A Superconducting Nb3Sn Coated Multicell Accelerating Cavity". IEEE Transactions on Nuclear Science. 32 (5): 3610–3612. Bibcode:1985ITNS...32.3610P. doi:10.1109/TNS.1985.4334443. ^ Salles Moura, Hernane R.; Louremjo de Moura, Louremjo (2007). "Melting And Purification Of Niobium". AIP Conference Proceedings. 927 (927): 165–178. Bibcode:2007AIPC..927..165M. doi:10.1063/1.2770689. ^ a b c Agulyansky, Anatoly (2004). The Chemistry of Tantalum and Niobium Fluoride Compounds. Elsevier. pp. 1–11. ISBN 978-0-444-51604-6. ^ Nyman, May (2011-08-02). "Polyoxoniobate chemistry in the 21st century". Dalton Transactions. 40 (32): 8049–8058. doi:10.1039/C1DT10435G. ISSN 1477-9234. ^ Lucas, C. R.; Labinger, J. A.; Schwartz, J. (1990). Robert J. Angelici, ed. 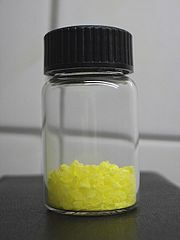 Dichlorobis(η5-Cyclopentadienyl)Niobium(IV). Inorganic Syntheses. 28. New York. pp. 267–270. doi:10.1002/9780470132593.ch68. ISBN 978-0-471-52619-3. ^ Lindenhovius, J.L.H. ; Hornsveld, E. M.; Den Ouden, A.; Wessel, W. A. J.; et al. (2000). "Powder-in-tube (PIT) Nb/sub 3/Sn conductors for high-field magnets". IEEE Transactions on Applied Superconductivity. 10 (1): 975–978. Bibcode:2000ITAS...10..975L. doi:10.1109/77.828394. ^ Glowacki, B. A.; Yan, X. -Y.; Fray, D.; Chen, G.; Majoros, M.; Shi, Y. (2002). "Niobium based intermetallics as a source of high-current/high magnetic field superconductors". Physica C: Superconductivity. 372–376 (3): 1315–1320. arXiv:cond-mat/0109088. Bibcode:2002PhyC..372.1315G. doi:10.1016/S0921-4534(02)01018-3. ^ Lilje, L.; Kako, E.; Kostin, D.; Matheisen, A.; et al. (2004). "Achievement of 35 MV/m in the superconducting nine-cell cavities for TESLA". Nuclear Instruments and Methods in Physics Research Section A: Accelerators, Spectrometers, Detectors and Associated Equipment. 524 (1–3): 1–12. arXiv:physics/0401141. Bibcode:2004NIMPA.524....1L. doi:10.1016/j.nima.2004.01.045. ^ Mallela, Venkateswara Sarma; Ilankumaran, V.; Srinivasa Rao, N. (1 January 2004). "Trends in Cardiac Pacemaker Batteries". Indian Pacing Electrophysiol J. 4 (4): 201–212. PMC 1502062. PMID 16943934. ^ Godley, Reut; Starosvetsky, David; Gotman, Irena (2004). "Bonelike apatite formation on niobium metal treated in aqueous NaOH". Journal of Materials Science: Materials in Medicine. 15 (10): 1073–1077. doi:10.1023/B:JMSM.0000046388.07961.81. PMID 15516867. ^ Csepei, Lénárd-István (2011). Kinetic studies of propane oxidation on Mo and V based mixed oxide catalysts. Technische Universität Berlin. pp. 157–166. doi:10.14279/depositonce-2972. ^ Schroeder, Henry A.; Mitchener, Marian; Nason, Alexis P. (1970). "Zirconium, Niobium, Antimony, Vanadium and Lead in Rats: Life term studies". Journal of Nutrition. 100 (1): 59–68. doi:10.1093/jn/100.1.59. PMID 5412131. 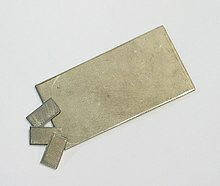 Wikimedia Commons has media related to Niobium. "Columbium" . Encyclopædia Britannica (11th ed.). 1911. Gilman, D. C.; Peck, H. T.; Colby, F. M., eds. (1905). "Columbium" . New International Encyclopedia (1st ed.). New York: Dodd, Mead.